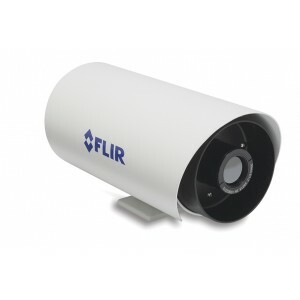 FLIR is one of the leading companies in the design and manufacture of Thermal Imaging Infrared cameras. They are one of the pioneers in the commercial infrared camera industry, the company has been supplying thermography and night vision equipment to science, industry, law enforcement and the military for over 50 years. FLIR Thermal cameras offer the ability to have true 24/7 imaging capability without the need for lighting or illuminators. FLIR’s Thermal cameras are extremely robust systems. Their vital core is well protected, meeting Mil-Std-810E and IP66 requirements, against humidity and water. A sealed lens maintains the environmental ratings of the existing enclosure. FLIR range of Thermal cameras included the rugged SR range, these can all operate between -32ºC and + 55ºC and have a built-in heater which enables a clear lens and perfect infra-red images to be displayed on the monitor even in extremely cold conditions. The SR range also features an “athermal lens”, which means the correct focus is maintained without the need for any user adjustments. FLIR Thermal cameras can be easily connected to the common power and video interfaces found in existing and new security systems. This means they can be easily integrated into any existing CCTV infrastructure.